A close look at the world's international basins gives a sense of their significance in terms of area and conflict potential (see map). Their growing number is one indication of this. A total of 214 international basins were listed in 1978, the last time any official body attempted to delineate them, and 261 were listed in a 2002 update. The growth is largely the result of the "internationalization" of national basins through political changes, such as the breakup of the Soviet Union and the Balkan states, as well as access to better mapping sources and technology. 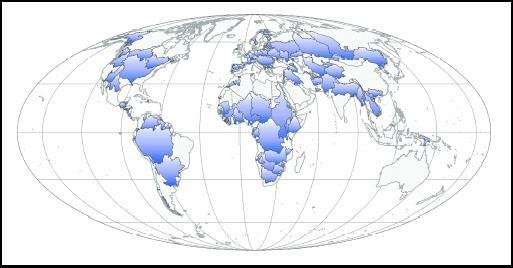 Even more striking than the total number of basins is a breakdown of each nation's land surface that falls within these watersheds. A total of 145 nations include territory within international basins. Twenty-one nations lie entirely within international basins, and, including these, a total of thirty-three countries have greater than 95 percent of their territory within one or more international basins. These nations are not limited to smaller countries, such as Liechtenstein and Andorra, but also include such sizable countries as Hungary, Bangladesh, Belarus, and Zambia. River basins and groundwater aquifers that cross international boundaries present increased challenges to effective water management, where hydrologic needs are often overwhelmed by political considerations. While the potential for paralyzing disputes are especially high in these basins, the record of violence is actually greater within the boundaries of a nation. There is some room for optimism, though, notably in the global community's record of resolving water-related disputes along international waterways. For example, the record of acute conflict over international water resources is overwhelmed by the record of cooperation. The past 50 years has seen only 37 acute disputes (those involving violence) and, during the same period, 157 treaties negotiated and signed. In fact, the last (and only) war fought specifically over water took place 4,500 years ago, between the city-states of Lagash and Umma along the Tigris River. nor economically viable. Shared interests along a waterway seem to consistently outweigh water's conflict-inducing characteristics. Furthermore, once cooperative water regimes are established through treaty, they turn out to be impressively resilient over time, even between otherwise hostile riparians and even as conflict is waged over other issues. For example, the Mekong Committee has functioned since 1957, exchanging data throughout the Vietnam War. Secret "picnic table" talks have been held between Israel and Jordan since the unsuccessful Johnston negotiations of 1953–1955, even as these riparian nations were in a legal state of war until their peace treaty was signed in the late 1990s. Finally, not only did the Indus River Commission survive through two wars between India and Pakistan, but treaty-related payments continued unabated throughout the hostilities. SEE ALSO Conflict and Water ; International Cooperation ; Law, International Water ; River Basin Planning ; Transboundary Water Treaties ; War and Water . Amery, Hussein, and Aaron T. Wolf, eds. Water in the Middle East: A Geography of Peace. Austin: University of Texas Press, 2000. Beach, Heather et al. Transboundary Freshwater Dispute Resolution: Theory, Practice and Annotated References. Tokyo, Japan: United Nations University Press, 2000. Elhance, Arun P. Hydropolitics in the Third World: Conflict and Cooperation in International River Basins. Washington, D.C.: U.S. Institute of Peace, 1999. Wolf, Aaron T., ed. Conflict Prevention and Resolution in Water Systems. Cheltenham, U.K.: Edward Elgar Press, 2002. Environmental Treaties and Resource Indicators. Center for International Earth Science Information Network, Columbia University. <http://sedac.ciesin.org/entri> . The Jordan River watershed is included within the borders of countries and territories—Israel, Jordan, Lebanon, Palestine, and Syria—each of whose water consumption is currently approaching or surpassing their annual supplies. The region also is particularly volatile politically, with five Arab–Israeli wars since 1948 and many difficult issues yet unresolved. Water resources have been related to regional conflict, having led historically to intense and sometimes armed competition, especially in the early 1950s and mid-1960s. Yet in recent years, the international setting of the basin has challenged the coriparian states to find ways to jointly manage their shared resource. Water has been a focal point of talks between Israel and the Palestinians, and was a major component of the Israel–Jordan peace treaty of 1994. Despite the region's ongoing volatility, the coriparian states continue to meet and cooperate in managing their scarce water resources.